Syracuse University School of Architecture presents the lecture “Project or Practice?” by internationally renowned architect, distinguished author and teacher Peter Eisenman on Friday, Sept. 30, at 5 p.m. The event is free and open to the public and will take place in Grant Auditorium at the Syracuse College of Law. A reception will follow at Slocum Hall in the atrium. Eisenman has lectured numerous times at Syracuse. His lectures are popular with students, faculty, alumni and visitors who travel to hear him speak. 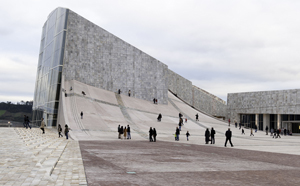 Eisenman is principal of Peter Eisenman Architects in New York City. His award-winning, large-scale housing and urban design projects, innovative facilities for educational institutions and series of inventive private houses attest to a career of excellence in design. The firm’s University of Phoenix Stadium for the NFL Arizona Cardinals opened in August 2006, and hosted Super Bowl XLII in February 2008. Among Eisenman’s many award-winning projects are the Memorial to the Murdered Jews of Europe in Berlin, the Wexner Center for the Visual Arts and Fine Arts Library at The Ohio State University in Columbus, and the Koizumi Sangyo Corp. headquarters building in Tokyo, which received National Honor Awards for Design from the American Institute of Architects. The firm’s Aronoff Center for Design and Art, the University of Phoenix Stadium and City of Culture of Galicia (in construction) have each been the subject of television documentaries. Eisenman is a member of the American Academy of Arts and Sciences and the American Academy of Arts and Letters. In 2001, he received the Medal of Honor from the New York Chapter of the American Institute of Architects, and the Smithsonian Institution’s 2001 Cooper-Hewitt National Design Award in Architecture. Popular Science magazine named Eisenman one of the top five innovators of 2006 for the Arizona Cardinals stadium. In 2007, Yale University Press published Eisenman’s “Written Into the Void: Selected Writings, 1990-2004,” and in 2008 Rizzoli published his book “Ten Canonical Buildings, 1950-2000,” which examines the work of 10 architects since 1950. His extensive teaching experience includes Cambridge, Princeton, Harvard, Ohio State and the Cooper Union. He is currently the Louis I. Kahn Visiting Professor of Architecture at Yale University. Eisenman holds a bachelor of architecture degree from Cornell University, a master of science in architecture degree from Columbia University, and M.A. and Ph.D. degrees from Cambridge University (UK). He holds honorary doctorates of fine arts from the University of Illinois, Chicago; the Pratt Institute in New York; and SU. In 2003, he was awarded an honorary doctorate in architecture by the Università La Sapienza in Rome. To learn more about Eisenman’s work, visit http://eisenmanarchitects.com.